Designed by architect George Fletcher Babb, this device was first used it as a motif in the terra-cotta cartouche at the entrance of the De Vinne Press Building. 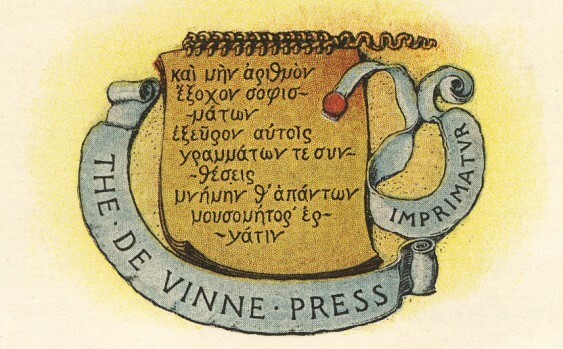 Appearing on De Vinne Press imprints from 1886 on, it depicts a tablet bearing a saying of Prometheus in Greek: “and further I discovered for them [i.e., mankind] numeration, most striking of inventions, and composition, nurse of the arts, producer of the record of all things.” This color version is from the title page of the De Vinne Press 1907 type specimen. De Vinne was a founder of the Grolier Club, where he designed and printed most of its publications during his lifetime. He collaborated with R. Hoe & Co. to advance fine printing from hand presses to power presses. In an age when the foremost method of illustrating popular periodicals was wood engravings, he was the recognized expert in printing them. His own taste in typography evolved from florid Victorian styles of his youth to the crisp Scotch-face fonts that he favored in his later work. He did not personally embrace the book as objet d’art, although he produced books in many different styles. In his view, the purpose of printing was to present an author’s thoughts as attractively but as clearly as possible. In his later work he used decoration sparingly and illustrations only to illuminate the text. Recognized for the superior quality of his presswork, De Vinne became the printer of choice for many institutions, publishers, and bibliophiles. One of the two typefaces he designed, Century, still enjoys popularity. While researching and writing ten books and 140 articles, he amassed a comprehensive and valuable library. The Romanesque Revival De Vinne Press Building on Lafayette and Fourth Streets in Manhattan, built to his specific needs, is today a city, state, and federal landmark. On the centenary of his death, the Grolier Club offers a public exhibition from February 19 through April 26, 2014, curated by Irene Tichenor and Michael Koenig. Jerry Kelly designed the richly illustrated exhibition catalogue. For public programs during the exhibition see grolierclub.org. Through the generosity of the Grolier Club and the exhibition’s two curators, APHA’s New York chapter is please to announce two free and public events (open to all, including non-members). Wednesday, March 19, 2014, 6:00 pm-7:30 pm. Lecture by Irene Tichenor, curator of “The Dean of American Printers” exhibition, and author of No Art Without Craft, the Life of Theodore Low De Vinne, Printer. Reception follows. TYPECASTING DEMONSTRATION. Stan Nelson, retired specialist, Graphic Arts Collection, National Museum of American History, Smithsonian Institution, will conduct a demonstration of typecasting, using equipment and techniques that would have been familiar to Theodore Low De Vinne. These events are presented at the Grolier Club in conjunction with the exhibition: “The Dean of American Printers: Theodore Low De Vinne and the Art Preservative of All Arts” Curated by Irene Tichenor and Michael Koenig, February 19 through April 26, 2014 at the Grolier Club, 47 E 60th St, NYC. Catalogs are available for sale at the Club. The plaque on the building, placed by the National Register of Historic Places, has a most unfortunate typo. It says the building was named for “Thomas” De Vinne instead of Theodore Low De Vinne. Irene Tichenor is the author of No Art Without Craft: The Life of Theodore Low De Vinne, Printer (Godine, 2005). 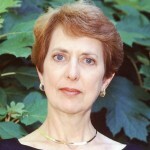 She is a Past President of APHA and a Past Vice President of the Bibliographical Society of America and has just been elected to the Council of the Grolier Club. She has a PhD and an MLS from Columbia University.